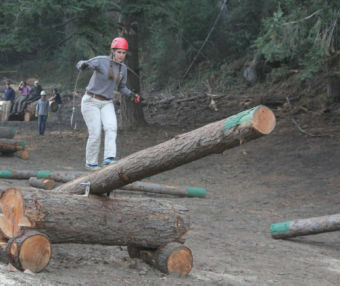 It was a cloudy, brisk morning in November as Erin Sheridan started warming up for Cal Poly San Luis Obispo’s Cal Conclave logging competition. Training for the competition began months before and Erin was ready. She knew the course well. She, and the rest of the logging team, spent every fall weekend working on it. The Swanton Pacific Ranch, owned by the university, is three hours north of Cal Poly’s campus off Highway 101. It was going to be an activity-filled day with four university logging teams competing in nearly 30 different events. Erin, winner of Plumas-Sierra Telecommunications’ 2016 scholarship award, is a junior at Cal Poly, and is majoring in agricultural and environmental plant science. The 2016 Portola High School graduate played volleyball and basketball for four years and was co-valedictorian of her graduating class. Erin arrived on the Cal Poly San Luis Obispo campus in fall 2016. She had been active in her community and school in Portola and started looking at potential clubs she could join. Erin was drawn to the logging team due to her roots in the Sierra Nevada’s. Transitioning to life in a beach town went smoothly, but Erin missed the forest and the logging team seemed like the perfect fit. 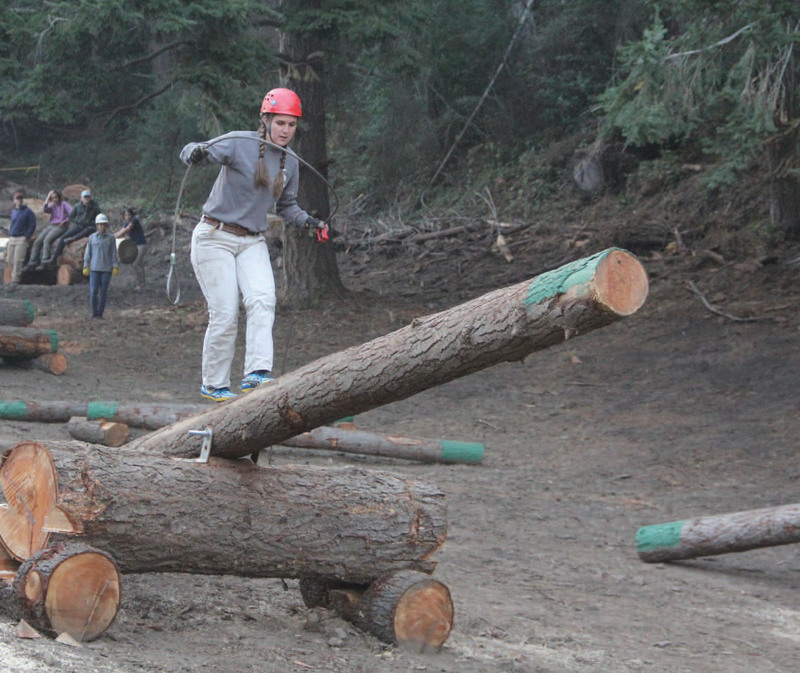 After joining the logging team it quickly became a large part of her Cal Poly life. Although she had no previous experience with timber sports, she caught on quickly and became one of the team’s top performers. Now Erin is the logging team’s secretary and is active in the club’s day-to-day activities. The training schedule can be quite rigorous: morning practices begin at 7 a.m. four days a week followed by three hour practices on Fridays. Weekends are reserved for visiting the university’s ranch near Santa Cruz. The Cal Poly team spent every weekend between September and the middle of November at the ranch, preparing to host Cal Conclave. Students had to clear and grade the land used for the events. Erin learned how operate a skidder, using it to move trees that had been cut to where they were used to build the obstacle course and other event set ups. They not only provided the physical labor to prepare for the event, they took care of organizing the weekend. From the evening banquet, to directing heats for different events to the awards. Three universities joined Cal Poly in the competition: Humbolt State University, Northern Arizona University and University of California Berkeley. Cal Poly won the competition. Erin was crowned the Belle of the Woods as the best female competitor of the competition. 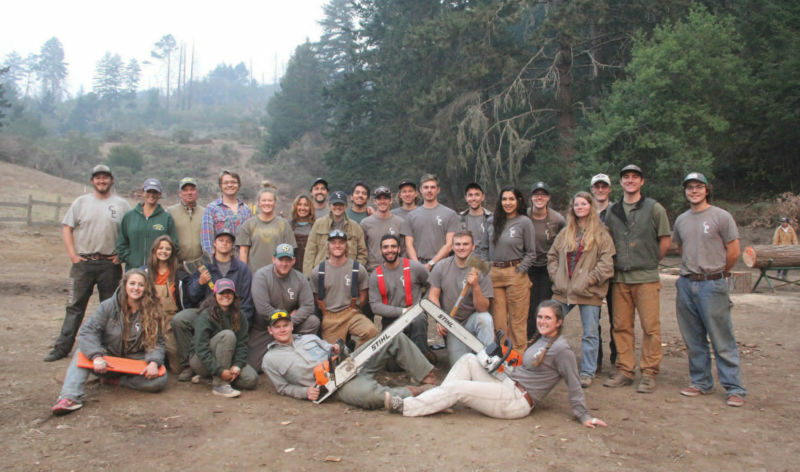 The logging team is made up of about 20 students, male and female. They compete throughout the school year, traveling to universities mostly on the West Coast. 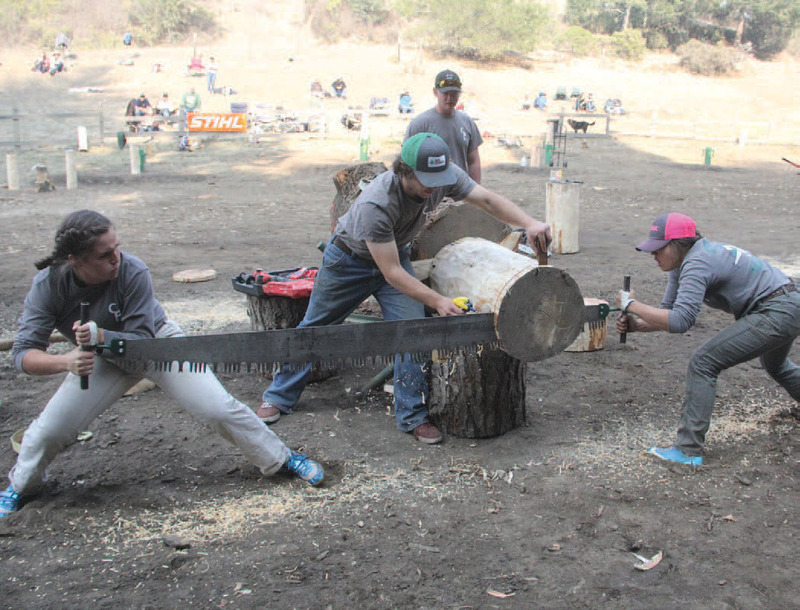 The team competes in events such as double bucking, ax throwing, horizontal and vertical chopping, and chain sawing. Participants develop practical working skills in a safe environment, as Erin did when learning how to run a skidder and bull dozer during construction of the Cal Conclave competition site. In their training, the team breaks down the event piece by piece, mastering one aspect before moving on to the next. Erin’s favorite event is chopping. The event requires the competitor to swing an ax, with the blade landing just inches from their feet. The event is taken straight from old-time logging practices. After Erin graduates from Cal Poly, she plans to use her degree in the education field. She hopes that one day she will return to Plumas County and work in land and resource management. You, or someone you know, could win a scholarship just like Erin did. PSREC and PST offer scholarships to students who receive either electric or internet services from PSREC or PST at their primary residence in Plumas, Sierra, Lassen and Washoe counties. There is no upper age limit to apply for scholarships. The deadline is March 15. More information can also be found on our Scholarships page or by calling 800-555-2207.